﻿ How to Prepare for a Records Purge - Augusta Data Storage, Inc.
Spring is a busy time for our secure destruction business. For many it marks the end of tax season. For others, spring fever kicks in and the “spring cleaning” itch is in full force! Whether you’re a business located in the Augusta metro area or a local resident, having a way to securely destroy your records is key to ensuring peace of mind as you’re lightening the load in your filing cabinets. If tax season also marks the end of your fiscal year, it might also mean it’s time for a bulk records purge. Bulk purging is what we call our large-scale destruction projects. It often involves archived records ranging an extended period of time (6-12+ months). During a bulk purge, these records are shredded all at once, as opposed to being a part of your regularly scheduled shred pickup. How Often Should My Business Purge Records? There is no set rule for scheduling record purges. Most often we see businesses using purge shred services based on their internal (or industry specifics) retention schedules, when they are relocating office facilities, or when the business is closing. How does my business know what to purge and what to keep? How should my business prepare for a purge project? 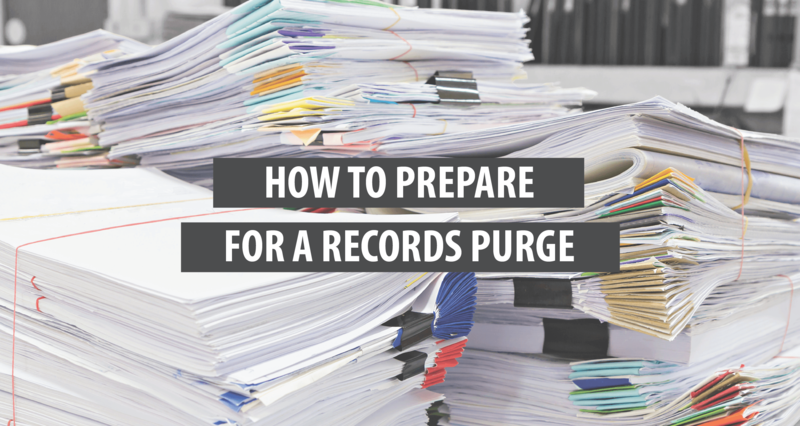 Once you’ve determined your retention schedule and know what stays and what goes, here are a few things you want to make sure to do beforeyour purge project takes place. We strongly encourage all of our customers to verify the retention requirements associated with their line of work. Requirements are different for each industry and it’s important to make sure that you are archiving records for the appropriate amount of time, and destroying those records when they are no longer needed. If your records are in boxes, please be sure to check them for items like 3-ring binders, binder and butterfly clips, and other bulky metal items that cannot be processed through paper shred plants. Here are a few tips to take into consideration. Don’t trust your secure destruction to any one! It’s important to maintain a secure chain of custody throughout the process. When you work with Augusta Data Storage, our trained, uniformed, and insured staff work to ensure that your records are kept secure throughout the process. Our processes and facilities are NAID AAA Certified, a certification we work hard to maintain. You can have your records shredded on-site, at your office, using our mobile shred plant, OR you can schedule to have your records picked up and transported back to our shred plant for processing. Regardless of which option you choose, your processes are NAID AAA Certified and come with a certificate of destruction for your records. Interested in learning more about our secure shredding process or scheduling a destruction project? Contact us today!